I have written before about how I have an end of the year tradition of putting up a pear tree. The students add pears on which they have written homophones or homonyms. I give them a sucker in exchange for putting the pear up. It becomes a bit of a competition and a learning experience. It amazes me that students still come up with new ones after about 8 years of collecting them. The tree is special because It is in remembrance of my 2nd grade teacher, Mrs. Pilatski who had great ways to engage her students. I have fond memories of her. She would like that it became a tradition. Also one of my colleagues bought the pear die a few years back in remembrance of her mother, a former teacher, who also collected homonyms. It made my paper cutting so much easier. 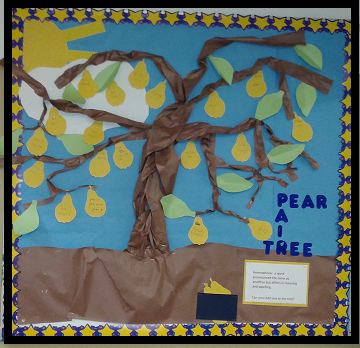 I say this is the last pair/pear tree because I am retiring at the end of this school year and I don’t know if the tradition will be continued. It still is a very nice finale for my bulletin board. I hope you have enjoyed all the art work my students have completed in their quest to give and follow directions in speech class. I am retiring, but Speech Therapy still runs in my veins. I will need to see how I reinvent myself. I too have used your pear tree idea in the past. Thanks for the inspiration. Congratulations on your retirement! After being an SLP since 1977 I too am pondering retirement… maybe next year. Best wished for your new adventure! My respect for you. You have a few years in. There have been a lot of changes since then. You dont realize how much until you reflect back. We could have quite a discussion. I have enjoyed using material from your blog as well. My career originally started in MN and ND. I believe that is your stomping ground?